We help differentiate your marketing materials & reference tools with creative solutions that enhance your brand. We can take a project from initial concept to final print production. We can create something new or collaborate with you to match existing marketing materials. A strong overall concept is essential to a great presentation. We have the creative resources to enhance and refine your message. Let us help you go beyond functional pieces and bring ideas to life. Graphic artists make ideas visual. Whether it is a mailer design, special promo piece, colorful poster, logo overhaul, catalog layout, or a detailed technical brochure, we can do it. We specialize in color correcting images to actual fabric samples for a close match when printed. 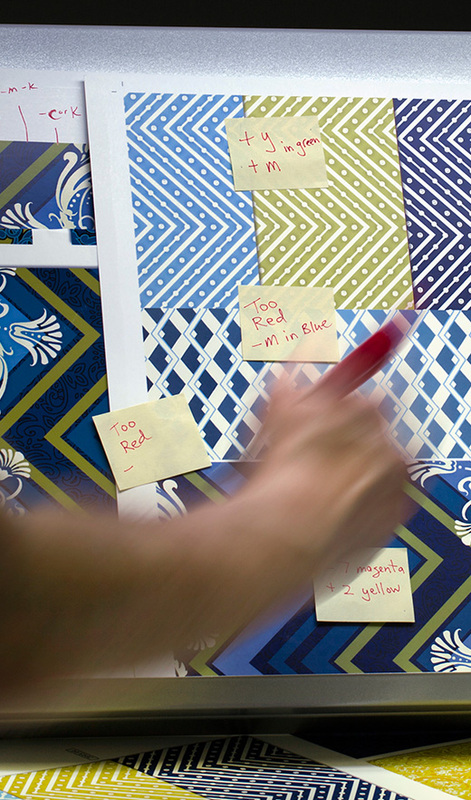 Some of our clients mix real fabric swatches with printed “swatch representations” in a project. We have a flexible studio on site for mannequin/model shots, small objects and flat items.